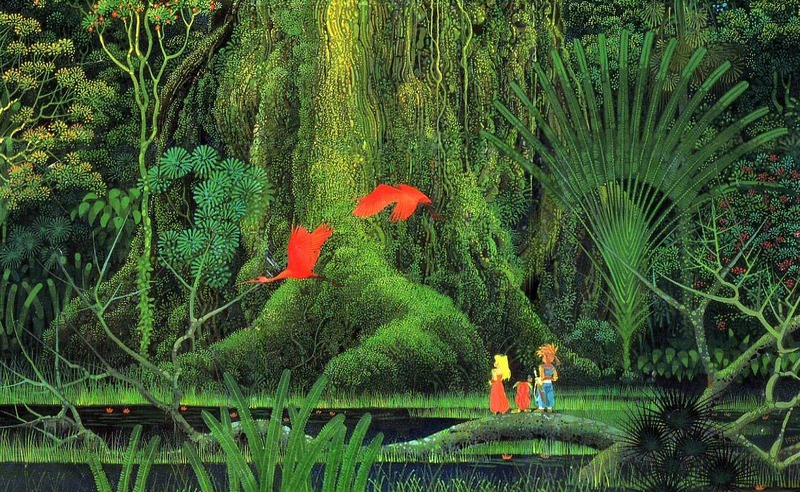 Image credit: Hiro Isono, via the Secret of Mana Wiki. Credited with having some of the best box art of all time, Secret of Mana deserves a remake directly inspired by its original packaging. The above image is the bottom third of an illustration by the late artist Hiro Isono. It appeared on the Secret of Mana SNES cartridge, box, and manual cover, and was also used for the Prima strategy guide. While drawing on a completely different style than the pixel art in the game itself, it gestured in a similar direction, evoking a sense of awe in the face of nature and the idea that humanity is just one small aspect of it rather than some domineering force to control and exploit it. The Secret of Mana remake came out this week, finally bringing a classic action role-playing game from the SNES-era to modern platforms. Unfortunately, it’s not very good. In some ways it’s even worse than the original. The polygon art especially feels plain and repetitive. Compared to the original it looks indistinct and hollow. Compared to promise of the original’s box art, it’s downright criminal. The game deserves more than a by-the-numbers 3D overhaul that strips away much of its personality. It deserves to be remade in line with the vision originally put forth in Isono’s work. Zack Kotzer recently made this point on Twitter and it’s something I’m sure many people who came into contact with the SNES version of Secret of Mana in its original packaging have thought too. First impressions have a powerful effect. Cases and manuals calibrate expectations and build up the mystery surrounding a game well before it gets booted up. This was especially the case with Secret of Mana. Where most box art tended to be higher quality renderings of scenes from within a game, Isono’s managed to put itself forward both as a bold, coherent, and unique piece of art while also maintaining a clear, inextricable link to the content and themes of the game it was for. It’s easy to settle on the most striking part of the box art being Isono’s excruciatingly detailed line work. Every leaf on every fern has some contrast of light and color distinguishing it from the rest. The shroud of moss climbing up the central tree feels at once soft and clearly defined. There are no shortcuts. Every part of the scene is practically buzzing. And yet it dodges any sense of being easy to pin down thanks to a pervasive anti-realism. Everything is flat and the colors are heightened. For all its specificity and exactness, the scene clearly remains an illustration and appears to be aggressively proud of that artifice. It’s the equivalent of a dolly zoom shot on paper in which the entire composition is drawn into focus without ever losing sight of every individual and independent part. That it nevertheless feels so natural and alive is part of its charm and brilliance. Isono did several other pieces oriented around the game, all of them similar in style, subject matter, and their gut-wrenching beauty. One of Secret of Mana’s surprisingly effective elements was its excessive lack of context. The story is based around a boy whose mother is a tree and whose father is a sword and who needs to use the power of both to end an industrial empire and kill a giant dragon-like beast, somehow bringing a harmonious, sustainable balance back to the natural world by doing so. Not much more is explained beyond that. Instead, the world and your journey through it does most of the talking. Like Isono’s art, the game conveys the drama of a time and place without diluting the experience in extraneous information. Many modern games strive for a certain purity in how they engage with the player, like Hyper Light Drifter’s commitment to sparse dialogue and limited use of Non-diegetic icons. Secret of Mana accomplished something close to this decades earlier, an accomplishment the current remake forgot when it decided to add extra scenes and voice-acted dialogue. For North American players especially, the original game’s no frills and at times seemingly incomplete localization helped perpetuate a sense of there always being more to what was going on than met the eye. The Prima strategy that released alongside the game had a walkthrough that was almost completely written as third-person narrative documenting the main characters’ journey, only further adding to the game’s enigmatic quality. And then there were Isono’s illustrations which offered a final set of singular, visually powerful possibilities to what the game might be and ultimately mean. Aware of this fact or not, Square Enix, then Squaresoft, made sure to include a small poster of the box art blown up to approximately six times the size. I can’t count how many times I’ve looked at it while distracted or in a day dream and caught myself hanging just on the edge of whatever larger world Isono was building with it; one where forests are huge and people are small, and every little bit pops but somehow without the slightest hint of overwhelming chaos. Years later the artifact is faded, creased, and tattered, but I still have it. It’s hard to know how a version of Secret of Mana designed to inhabit Isono’s illustrations would work, but I know exactly what it would look like.